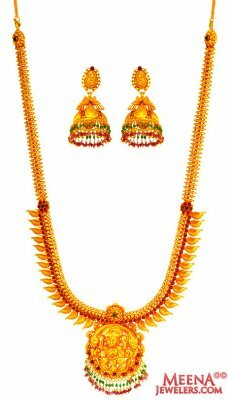 22Kt Gold Necklace and Earrings set is designed in a gerua finish with a beautiful pendant embossed with goddess Laxmiji sitting on a flower at the center and hanging colored stones. Necklace is studded with rubies and emeralds that adds beauty to it. Earrings are jhumkhi style with engraved goddess Lakshmi and hanging ruby and emerald stones with a screw back post.